Custer Public Power is governed by a seven member board of directors. The board, which meets monthly, is responsible for setting guidelines for our operation, oversee the costs and spending at the District, and plans our future direction. The board is made up of seven individuals who serve for a six year term. They are elected at large in the general election of even-numbered years. 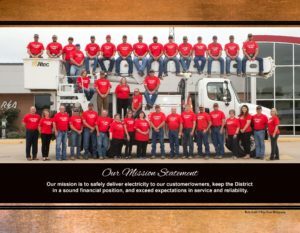 Any customer whose primary residence is in Custer Power’s territory can run for the board in the fall general election. Custer’s board meetings are normally held on the last Thursday each month and begin at 10:00 a.m. in the District’s Headquarters at 625 East South E in Broken Bow. The meetings are open to the public. If you have questions about board responsibilities or about the voting process, or would like more information about the current Board of Directors, please contact Custer Power at 308-872-2451.